Summer is here! Well, on some days anyway. During Summer, more upper body dominant sports have their competitive seasons such as tennis, cricket, baseball and softball. 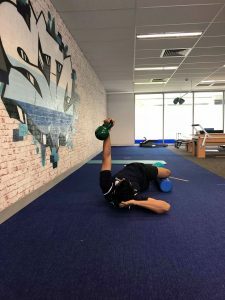 If you are transitioning from a lower body dominant sport into an upper body dominant sport or trying a new sport this year, you may be noticing different muscles are getting sore and tired. 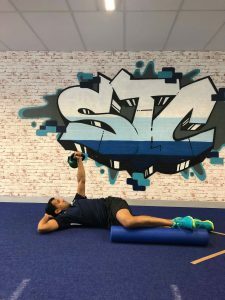 This next exercise is great for increasing your thoracic (upper back) rotation as well as strengthening your shoulder to make sure it stays healthy and injury free for the summer seasons. 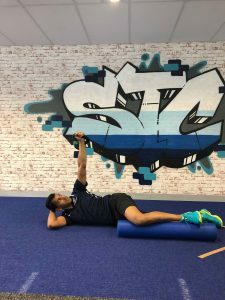 Muscles targeted in this exercise include your thoracic rotators as well as your serratus anterior and your shoulder stabilisers. 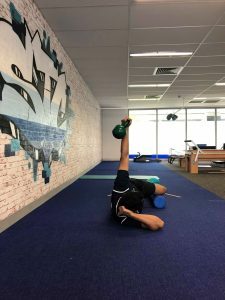 Try this exercise 2-3 sets of 8 reps on each side with a moderately weighted kettlebell or dumbbell.